Shot-sized soup servings to tide you over until dinner. In a stock pot, bring chicken broth to a boil. Add garlic, onion, potato, butternut squash and boil for 15 minutes or until fork tender. Strain vegetables and reserve 1 ½ cups of stock. Using a blender, puree the vegetables. Slowly add reserved stock to reach a soup consistency. Add sugar, salt, ginger and cinnamon. Stir until well combined. For the spiced cream: In a mixing bowl, whip heavy cream with an electric mixer until soft peaks form. Add cinnamon and nutmeg, mix for another 10 seconds. 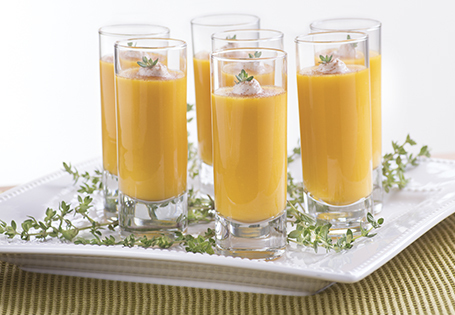 Pour soup into shot glasses and top each shooter with a dollop of cream. TIP: This recipe can be made into a soup course for a sit-down dinner.